The Bourne squad who won the Under 18 Division One title: Scott Buxton, Max Cooper, George Burke, Jordan Cotton, James Moss, Zac Allen, George Hick, Conor Culverhouse, Ollie Reid, Ben Moss, Lewis Fountain, Ian Goode, Jimmy Morten, James Roberts, Zak Munton, Ross Hollingsworth. Bourne Town Juniors Black have been crowned Peterborough Youth League Under 18 Division one champions. Bourne won their final match 5-1 against Glinton & Northborough to ensure they pipped Peterborough Northern Star to the title. Ian Goode bagged a hat-trick, while Max Cooper and James Roberts were also on target. Goode’s treble meant that he beat team-mate Zak Munton the division’s ‘Golden Boot’. Goode finished on 31 goals in 16 appearances, while Munton scored 29 in 15 games. This is a fantastic end to an 11-year journey from under eights right through to the final year of youth football. 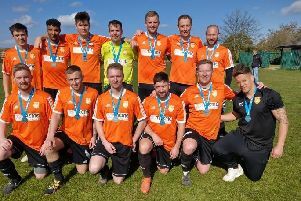 Three of the team have completed the whole 11-year campaign, goalkeeper Scott Buxton and defenders James Moss and George Burke. Jordan Cotton started with another Bourne team before moving sides when the other side folded.